Become Qui Gon Jinn's Padawan and go on to apprentice Luke Skywalker as one of the few Jedi to survive the Clone Wars in our Obi Wan Kenobi costumes. Great for Halloween costumes and Star Wars conventions, our costumes are available in sizes ranging from toddler to extra large adult, and many styles from the original trilogy to the Clone Wars series. 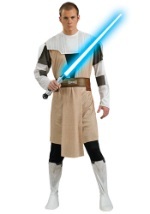 Become a key player on the Jedi side of the Star Wars saga in an Obi Wan Kenobi Halloween costume.